Preliminary ProceduresRecover the refrigerant. Refer toRefrigerant Recovery and Recharging.Raise and support the vehicle. Refer toLifting and Jacking the Vehicle.Remove engine splash shield right side. Refer toEngine Splash Shield Replacement - Right Side.Remove the drive belt. 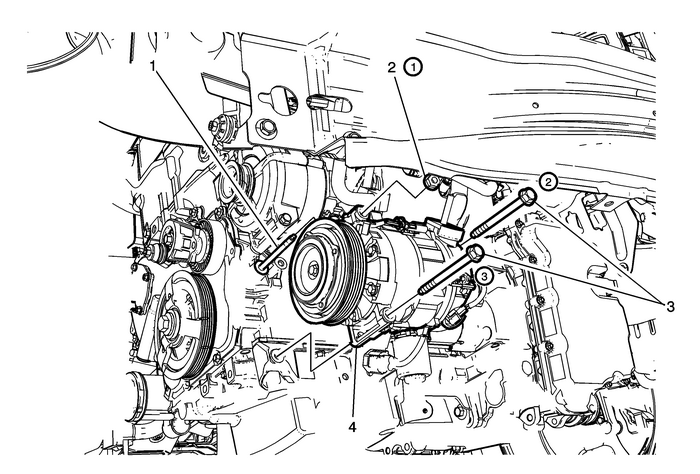 Refer toDrive Belt Replacement.Disconnect the A/C compressor electrical connector.Remove the air conditioning compressor hose. Refer toAir Conditioning Compressor Hose Replacement. Note:Tighten the A/C compressor mounting fasteners in sequence.